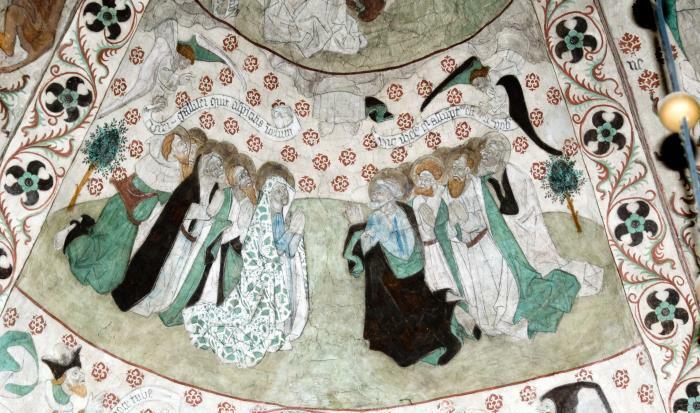 The impressive frescoes that cover the walls of the church of Täby in Sweden, are the work of the painter known by the name of Albertus Pictor (c. 1440-1509), meaning Albert the painter. The construction of the church of Täby, now a suburb of Stockholm, commenced during the 13th century and was completed by the end of it. 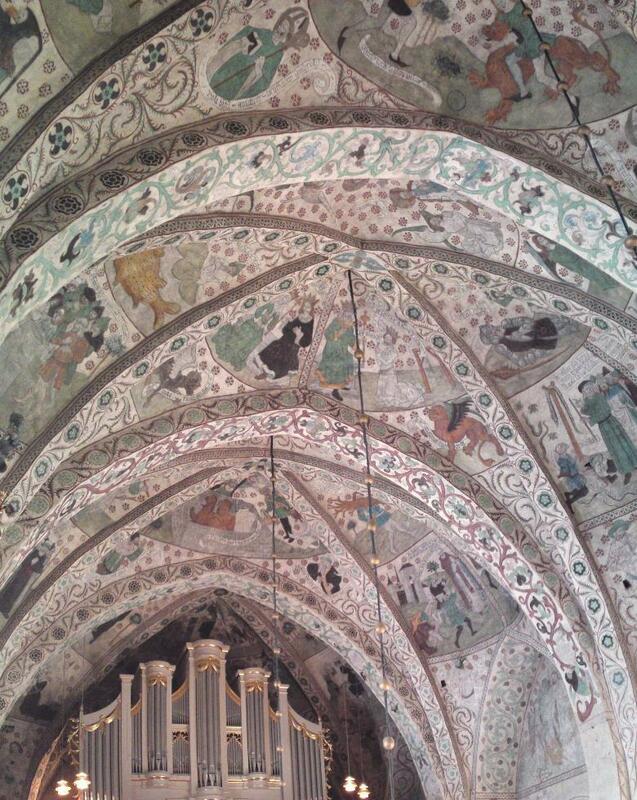 In the 15th century the wooden ceiling was replaced by vaults that were painted by Albertus Pictor. After the removal of a coating of plaster, his 66 biblical scenes resurfaced when the frescoes were restored in 1993-1994. The image above shows the west side of the church, where the organ and entrance are located. The murals, however, cover just about the entire interior of the church. Except for the places that could not be restored, there are no empty spots. Even the spaces between the biblical scenes are filled in with flower motifs and the arches are covered with plant motifs. Here we see the fear of the late Gothic period of leaving empty, unadorned spaces. The dominating colours are ochre, red and water green. Albertus Pictor came originally from Germany. His name appears in Swedish archives in 1465 for the first time, when he moved to Arboga, a town about 150 kilometres west of Stockholm. In 1473 he is mentioned in a marriage register in Stockholm, where he settled in that same year. 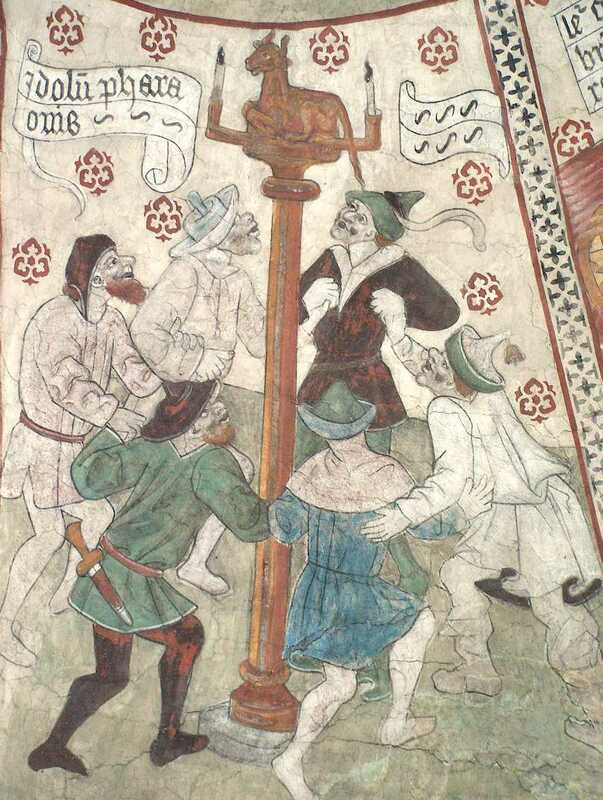 Frescoes by Albertus Pictor and his workshop can be found in numerous churches in Sweden and also in Denmark, in more than 30 places in total. 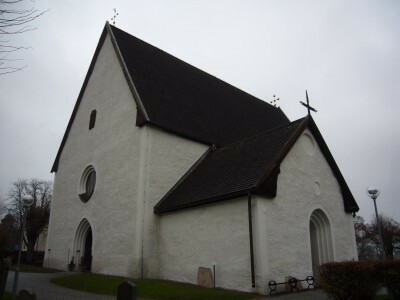 Those in the Täby Church excel in technical execution and are also the best preserved. The work by Albertus has inspired many artists after him. The most famous image is undoubtedly that of a person playing chess with Death, which inspired Ingmar Bergman, the great Swedish film director, to include a knight playing chess with Death in his film The Seventh Seal (1957). 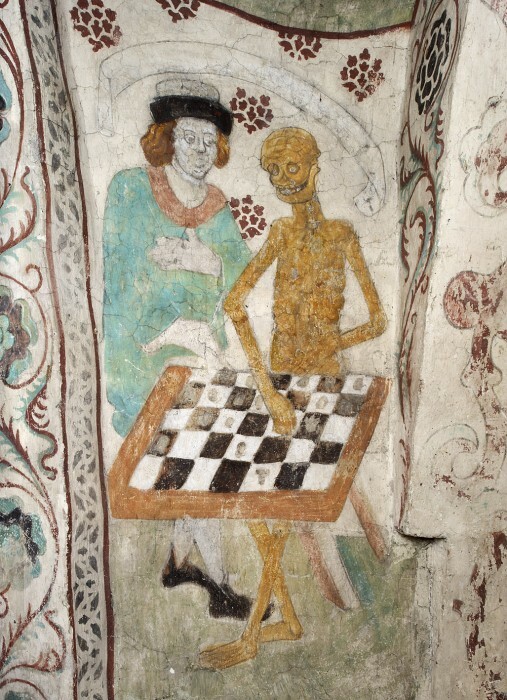 Death asks the knight how it is that he knows that he plays chess. ‘I have seen this in murals,’ the knight answers. Images in churches powerfully reinforced knowledge of the Bible for illiterate people who learned its basic stories through hearing sermons and seeing mystery plays. New Testament scenes are combined with Old Testament narratives that foreshadow key moments in the life of Jesus. For instance, Enoch (Hebrews 11:5: ‘By faith Enoch was taken so that he did not experience death; and ‘he was not found, because God had taken him.’) is portrayed together with Elijah (2 Kings 2:11: ‘As they continued walking and talking, a chariot of fire and horses of fire separated the two of them, and Elijah ascended in a whirlwind into heaven.’). These ascensions of Enoch and Elijah foreshadow the Ascension of Christ, which is portrayed directly underneath. In the depiction of the Ascension of Christ only his feet and the bottom of his robe are visible, while Mary and the apostles kneel in prayer, their eyes raised to the feet of Christ. Above the disciples two angels hold a pennant in their hand with inscriptions in Latin from Acts 1:11: ‘Viri Gallilei, quit aspicitis in celum?’ (Men of Galilee, why are you looking at the sky?) and ‘Hic Ihesus, qui assumptus est a vobis’ (This Jesus, who was taken from you into heaven). Such inscriptions accompany each scene. 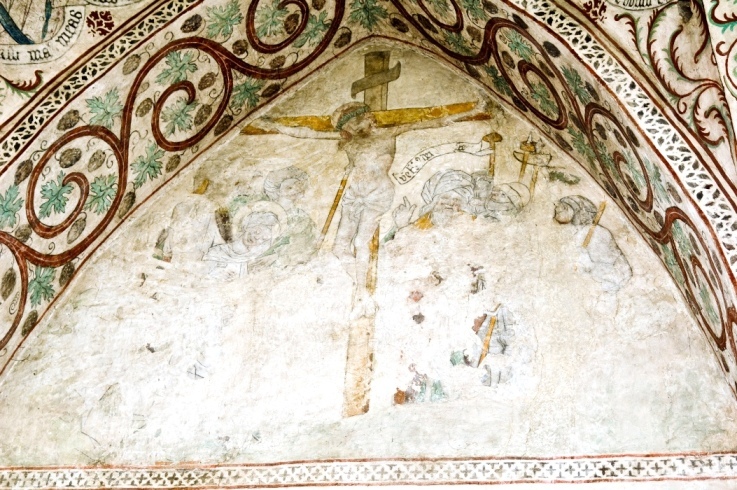 On the north wall a Crucifixion can be seen that forms a pair with the Sacrifice of Isaac above it. In a similar way many stories from the Old Testament are connected with New Testament events, together forming four walls and a ceiling that are not only very beautifully decorated, but that are also extremely rich in theological content. It is not possible to discuss all these interconnections here. My hope is that the scenes by Albertus Pictor shown here lift just a corner of the veil of the complexity and richness of medieval art. 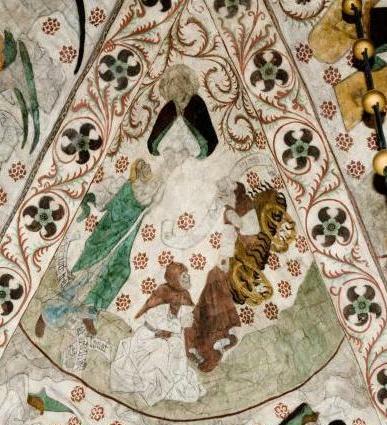 Albertus Pictor: Frescoes in the Church at Täby, Sweden, end of 15th century. Caroline Levisse is a French art historian, who is presently working in Copenhagen on a dissertation about religion in contemporary Scandinavian art. She published this discussion of the church at Täby on her blog on the French website www.narthex.fr, whichis an extensive website devoted to the sacred arts, religious heritage and religion in contemporary works of art. The link to her article on Täby Church is www.narthex.fr/blogs/chroniques-scandinaves/les-fresques-de-leglise-de-taeby-suede-fin-du-15eme-siecle.